Theatre Lab’s new musical comedy, currently onstage at the Factory Studio Theatre, can be summarized in one word: clever. 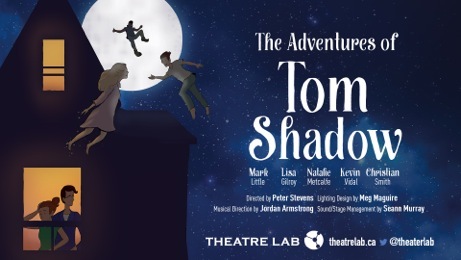 The title- The Adventures of Tom Shadow- suggests a Peter Pan-type protagonist and a familiar tale of his far-flung adventures. The opening scene features the expected happy nuclear family at bedtime and, when the parents leave, Tom Shadow takes his cue to swoop in and take the children on a magical adventure. Instead of telling the story of the children’s fantastical adventure, however, it follows the parents’ unravelling when the kids don’t return. It’s dark, it’s heavy, but despite this, or maybe because of it, it’s absurd and funny. Each member of the comedy all-star cast plays a handful of characters between whom they easily transition without costume changes. Even secondary characters with just brief appearances are fully explored through detailed voice and physical work. Considering the range of the characters- from children to suburban parents to murderous psychopaths- the depths of research and rehearsal that had to occur for this to read so well is outstanding. The cast, with director Peter Stevens, wrote the script, allowing their personalities and skills to shine through. Intricate layers of motifs compound the humour as the action progresses, creating complex and multi-dimensional jokes. Even the slapstick humour, specifically John falling down the stairs, is executed with sophistication that makes it more than just a jocular tumble.There is no stand out performer, good or bad, in The Adventures of Tom Shadow but rather a complementary ensemble all working for the betterment of the show rather than themselves. There’s also a large musical component to the show with the performers periodically bursting into popular tunes with changed lyrics and choreographed dance numbers. No one on stage appears to be a trained singer or dancer but the rawness of their crooning adds charm and is consistent with the play’s ramshackle tone. I love that each actor doesn’t try to be anything more than what they are; their charisma is enough to delight. If you are looking for high energy, dynamic physical comedy that’s well constructed and mingles dark humour with the absurd, then don’t miss Tom Shadow. Bring a friend.